This inn, located near the 7th hole of the Kabale Club Golf Course, offers scenic views over the Rugarama Valley and the Kigezi Highlands. A variety of rooms are available, all en suite. The inn has a restaurant, well stocked bar, swimming pool, sauna and digital satellite television. This inn is located in the famous Kigezi Highlands, known as the “Switzerland of Africa”. Surrounded by terraced farming and mountain scenery, the hotel was named for the European settlers who used to ride their beautiful white horses on nearby Makanga Hill. All rooms are en suite with views of the terraced hills and the late afternoon and early morning mist in the valley below. A fireplace in the inn’s lodge provides warmth in the cool evenings. 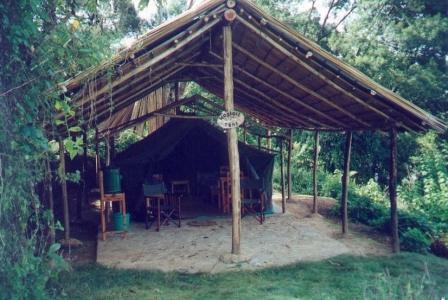 This island camp is located 9 km offshore on a private island in the middle of Lake Bunyoni. Transport by motor boat is necessary to reach the camp. Safari tents with thatched roofs and two room brick cottages all offer views of the lake from private verandas. The indoor and outdoor restaurants cater to all types of weather and provide the warmth of a bonfire in the evenings. Boats are available for exploring the lake and bird watching. Bushara Island Camp is a community project run by a local church group that ensures Lake Bunyoni’s local communities benefit from the camp’s proceeds. This camp, located on the shores of Lake Bunyonyi, provides basic but comfortable accommodation in en suite cottages overlooking the lake. 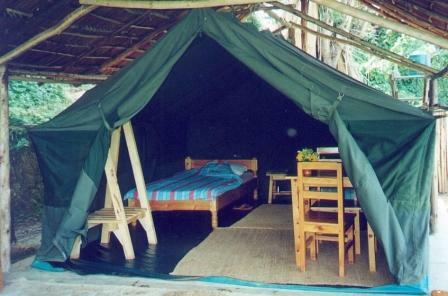 The camp also offers two bedroom family cottages with a sitting room, kitchen, and private veranda. There is also some tented accommodation for hire. Meals and bar service are available.